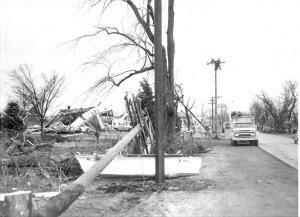 Perhaps the most significant weather event in Crystal Lake occurred 50 years ago. 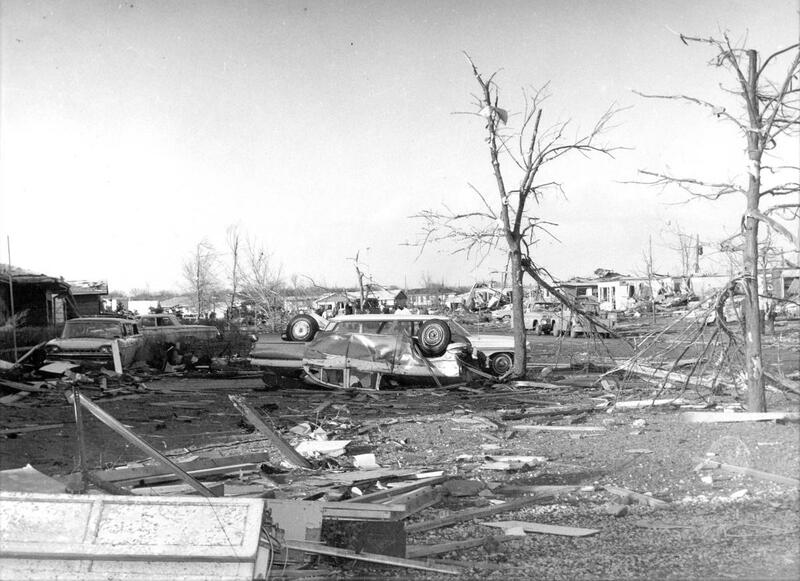 On Sunday, April 11, 1965, a massive tornado ripped through Crystal Lake, killing five people, destroying or damaging hundreds of homes and businesses, and forever changing the lives of those who lived through this destructive event. April 11th — It was Palm Sunday, one week before Easter. 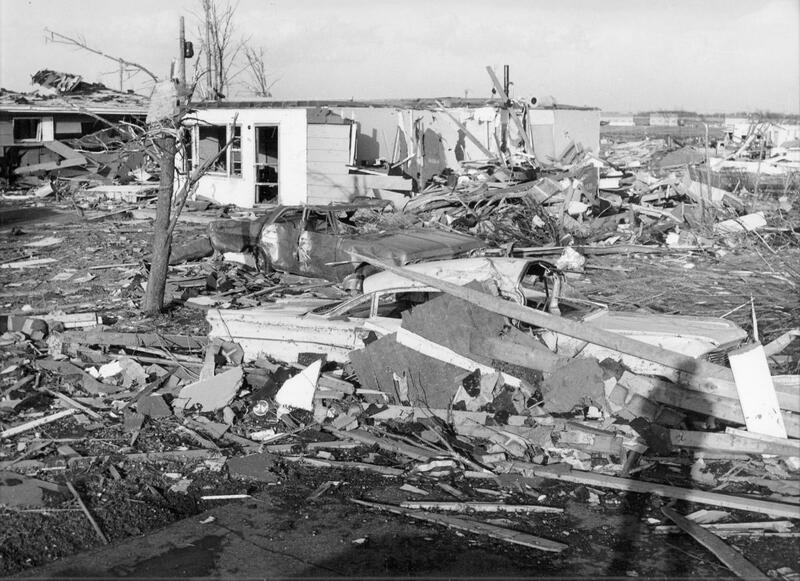 Many Crystal Lake residents went to church in the morning, never suspecting how different their lives would be just a few hours later. 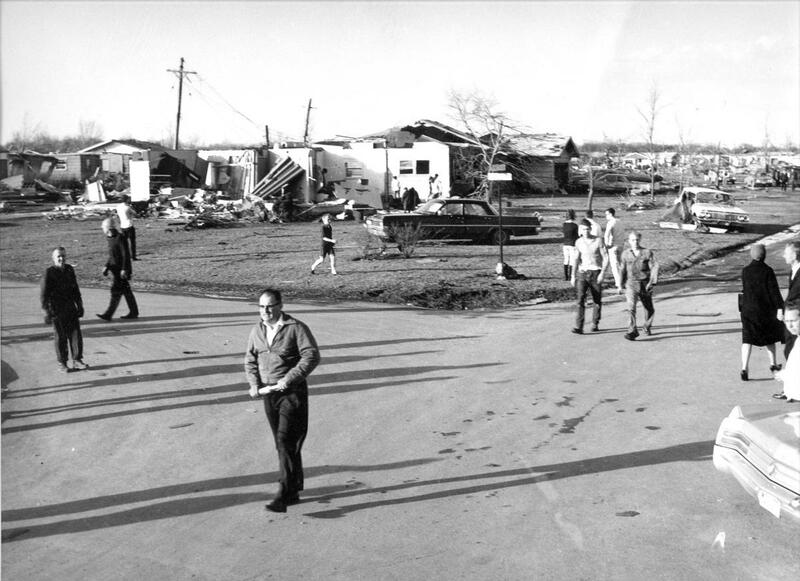 In 1965, Crystal Lake did not have a tornado warning system in place. 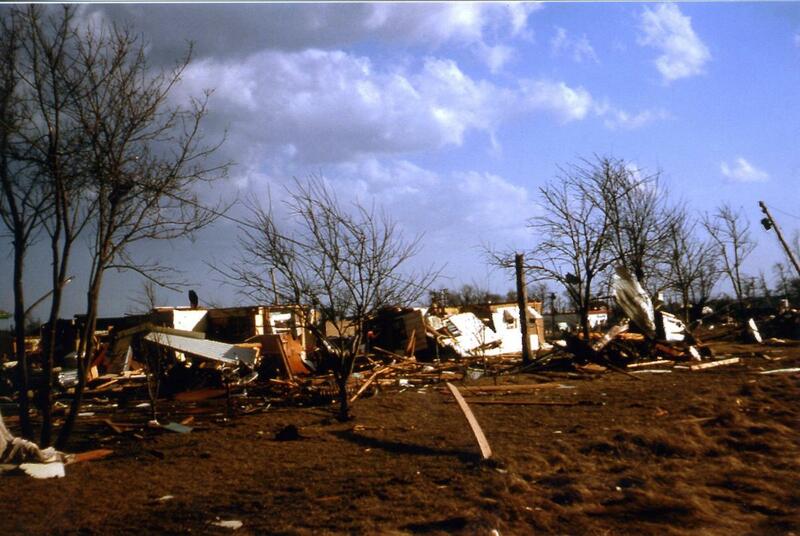 People generally relied on their radios, televisions (or their eyes and ears) for severe weather warnings. The tornado hit about 3:30 in the afternoon, and caught many people by surprise. 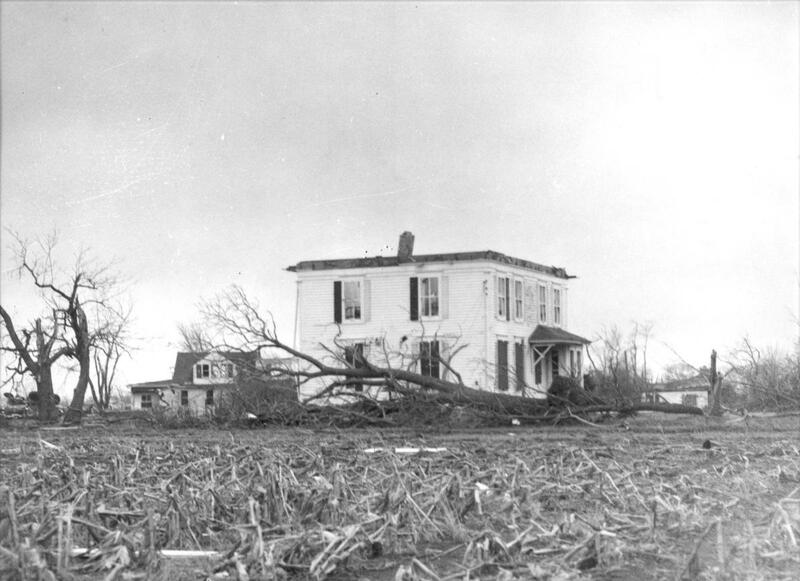 The Ivan Hill Farm (Barlina Road) on the south edge of town was one of the first to feel the storm’s wrath. 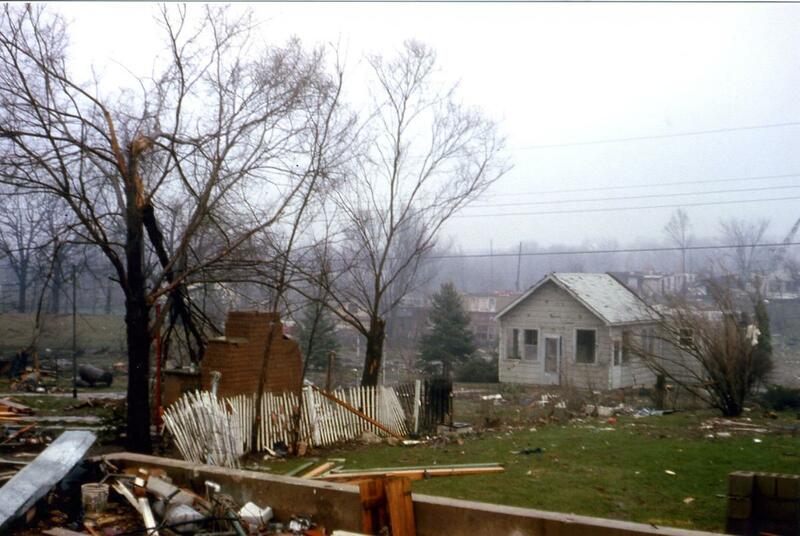 Fences and trees disintegrated as the tornado stirred up trouble for anything or anybody in its path. 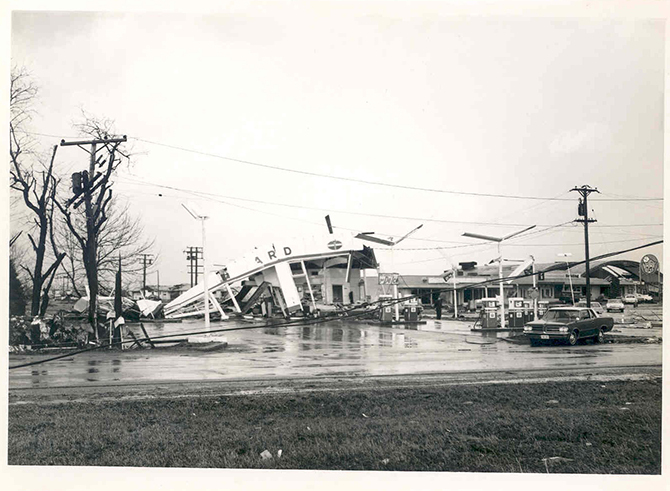 Rae Goss’s property was located near the corner of Virginia Road and Route 14 (near today’s Country Donuts). 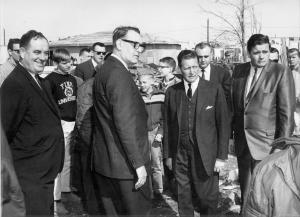 Rae Goss was a strong supporter of youth. He felt they needed a safe place to play. So, despite the fact that his own children were grown, Rae Goss totally remodeled the interior of a large barn into a full-size basketball court. On April 11th, Rae had gone out to the barn. 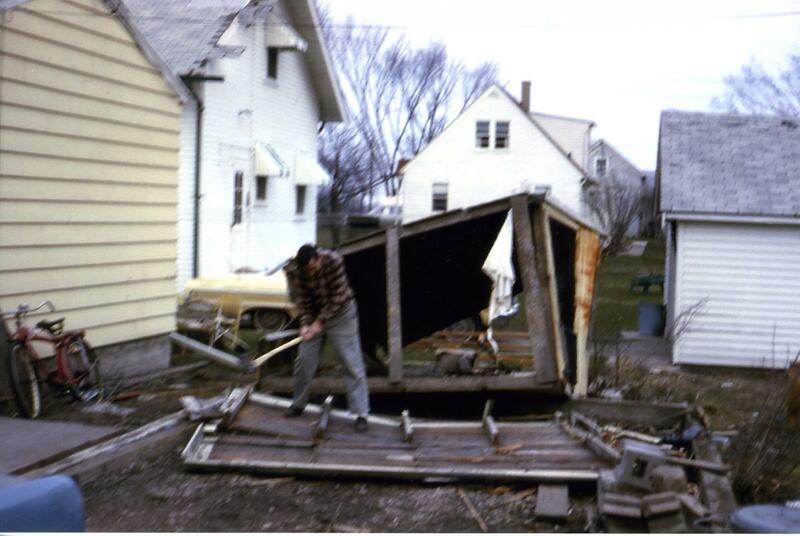 The storm struck while he was outside, and the winds toppled the barn onto Rae. Stories vary as to why Rae was out in the storm. The April 15, 1965, Crystal Lake Herald reports, “Concern for children may have been responsible for the untimely fate of Rae Goss of Virginia Street. 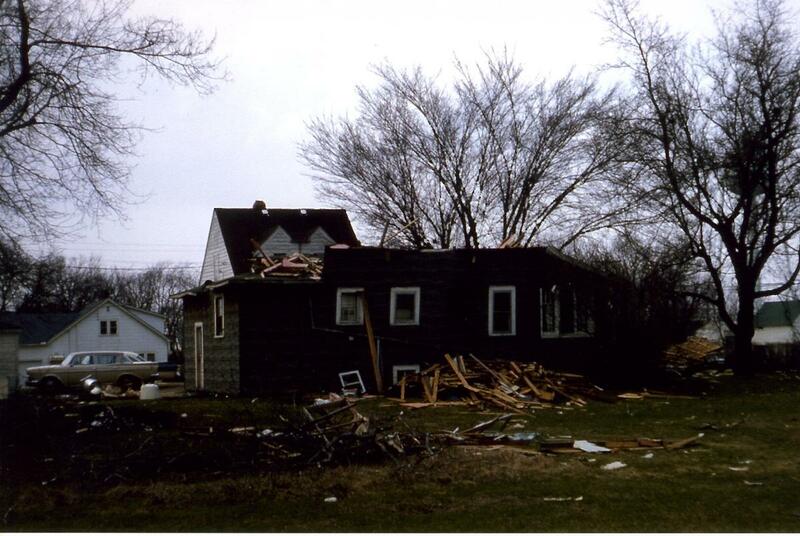 Regardless of why he was outside, Rae Goss was the tornado’s first victim in Crystal Lake. Those that knew him, wholeheartedly agree that he was an amazing man! 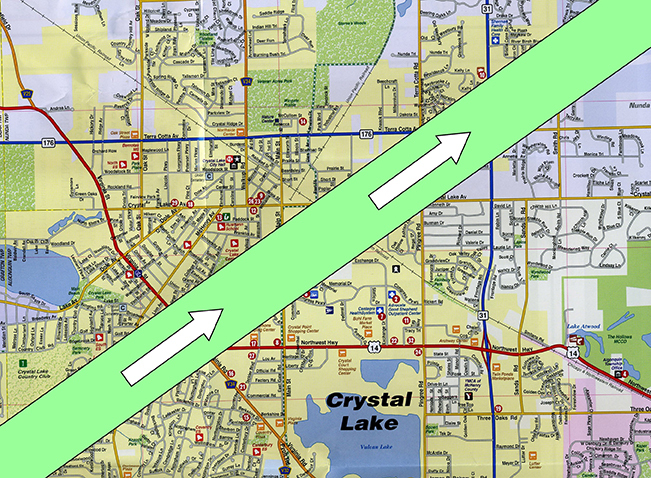 Across Route 14 from Rae Goss’s place is the intersection of Route 14 & Keith, the Crystal Lake Plaza, and behind that the Colby subdivision. 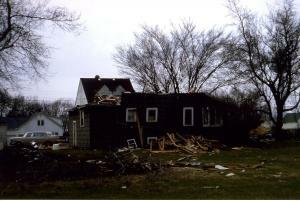 This is the area of Crystal Lake hardest hit by the tornado. 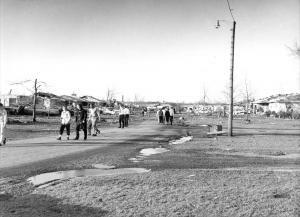 Colby’s Subdivision was developed by Crystal Lake native Raymond Colby during the postwar housing boom of the early 1950’s. 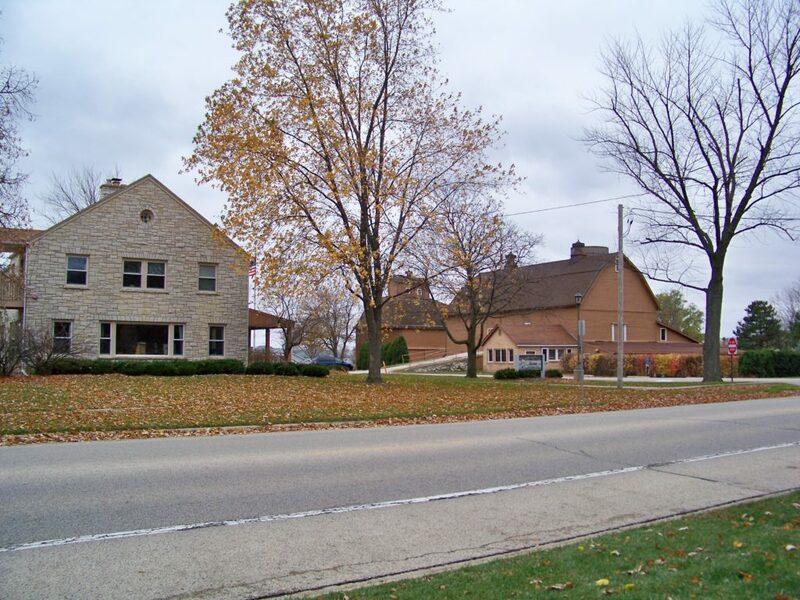 The Colby subdivision is located directly behind (north) of the Crystal Lake Plaza. The 1965 Palm Sunday Tornado decimated Colby’s Subdivision. 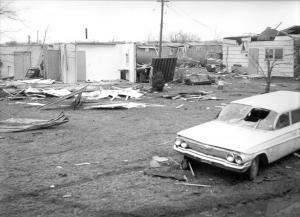 Hundreds of homes were destroyed or severely damaged. Very few homes escaped the storm’s destruction. 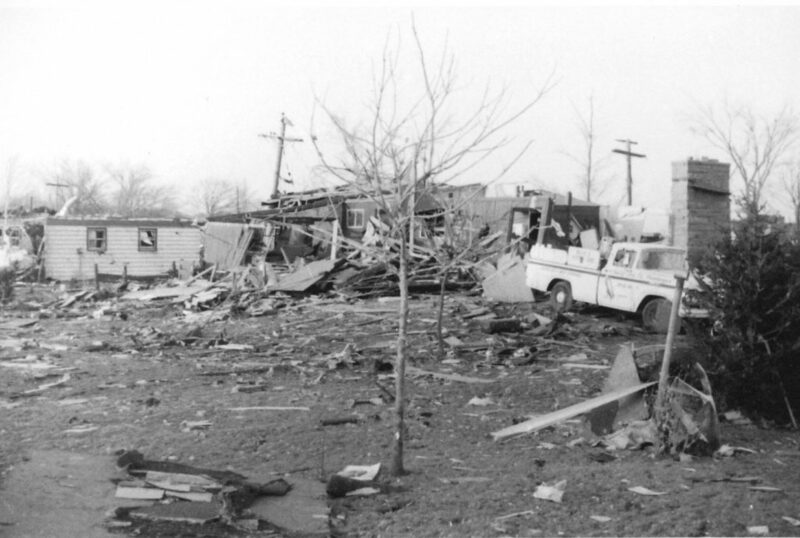 With so much destruction, it is no surprise that deaths were reported. The tornado’s second Crystal Lake victim was Louis Knaack. Louis & Fern Knaack and their large family lived on Harold Street. Although the children stayed inside the house, the parents went outside to secure the family’s camping trailer. The tornado struck while Mr. & Mrs. Knaack were running for shelter. 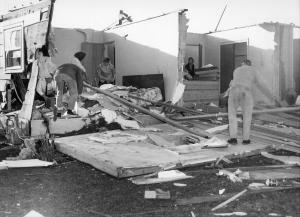 Both were hit by flying debris, knocked to the ground, and then crushed by a falling wall. Louis Knaack was killed instantly. Miraculously, Fern Knaack survived, although she was seriously injured. The tornado’s third, fourth, and fifth Crystal Lake victims were all from the same family. 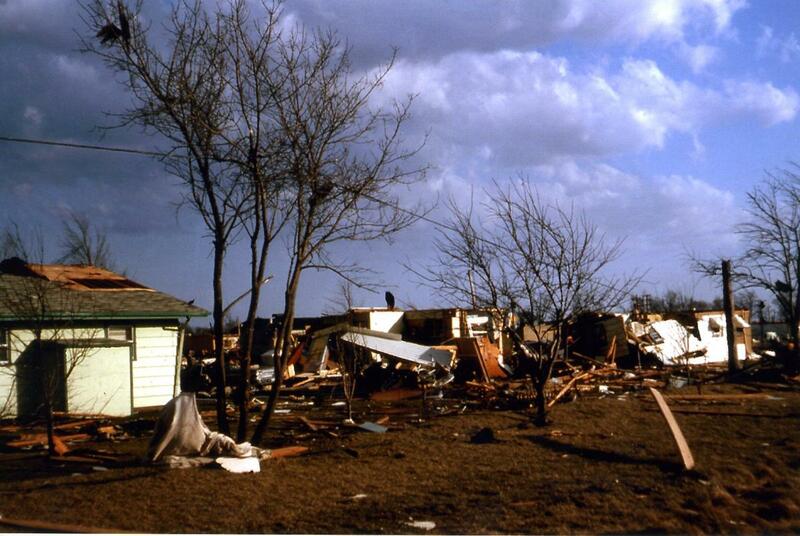 Richard and Rosalie Holter and their 20-year old son John perished in the storm. 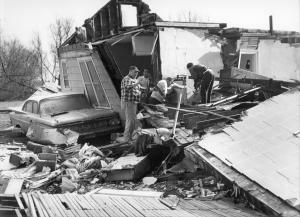 Two other children, Louella and Jim were not home and survived. 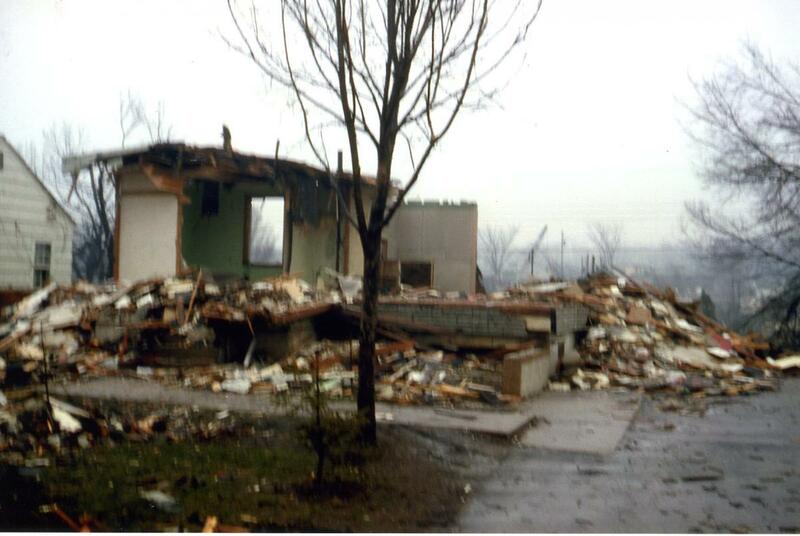 Here is a photo of what remained of the Holter house on Union Street after the tornado. 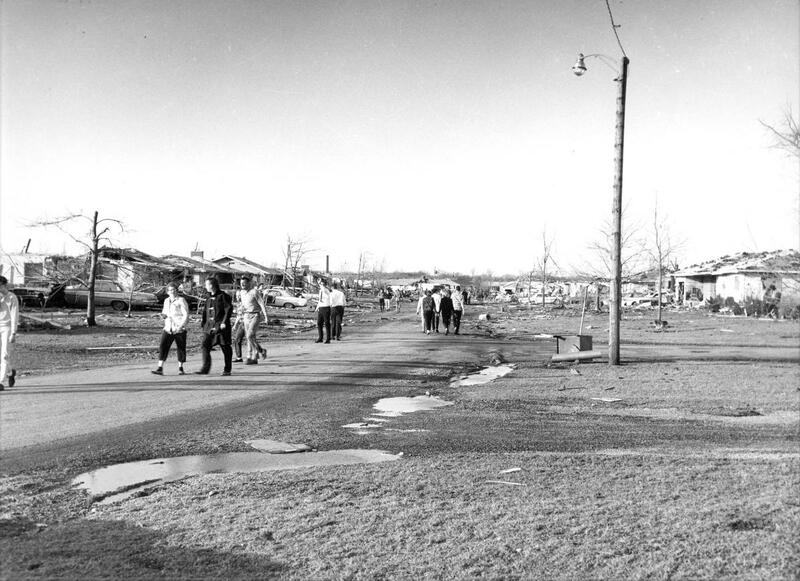 After flattening Colby’s Subdivision like a pancake, the tornado continued on a northeast course across the field behind the high school and hopping over toward Main Street. Next in its path was the Statter Wallpaper Mill. 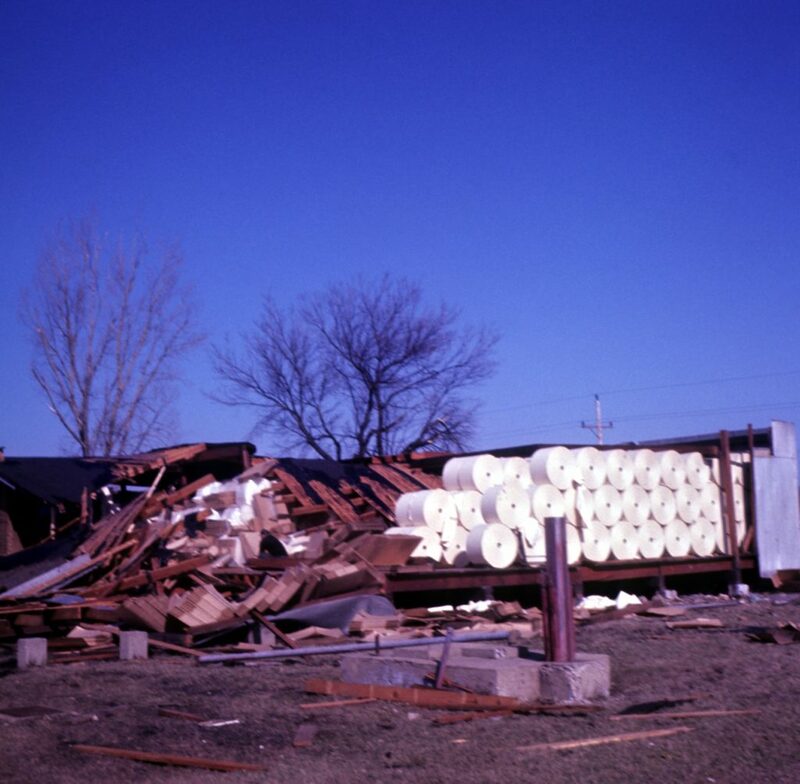 The Statter Wallpaper Mills lost several warehouses to the storm. 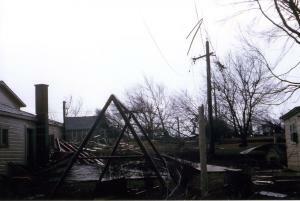 It is said that one of the roofs from a warehouse was thrown 400 feet away. Crystal Lake’s largest industry, Oak Manufacturing, was at the edge of the storm’s path. 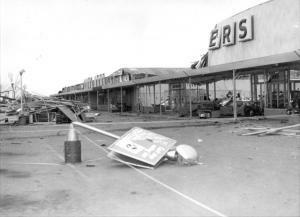 Although a number of windows were broken, the damage was not severe enough to interrupt operations on Monday. The funnel then raced down Crystal Lake Avenue. The James Dopke house at 551 E. Crystal Lake Avenue was lifted off its foundation and settled on 19-year-old George, son of Mr. Dopke, who had been blown out of the basement. George was rescued and taken to a hospital where he spent four weeks. At Crystal Lake Avenue & Pingree, the mink pens of Donald Kopsell were torn apart and terrified mink scrambled for cover in their unexpected freedom. After the storm passed, Frantic hunting was done by Mr. Kopsell and his friends to try and recapture as many mink as possible. 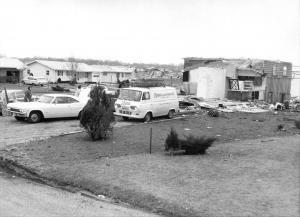 On the far northeast side of Crystal Lake, many homes in the Orchard Acres subdivision were heavily damaged or destroyed by the tornado. 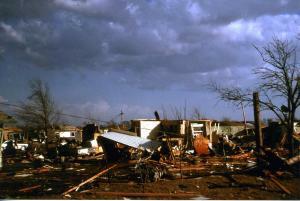 The storm skipped through the subdivision leaving a haphazard path of destruction. 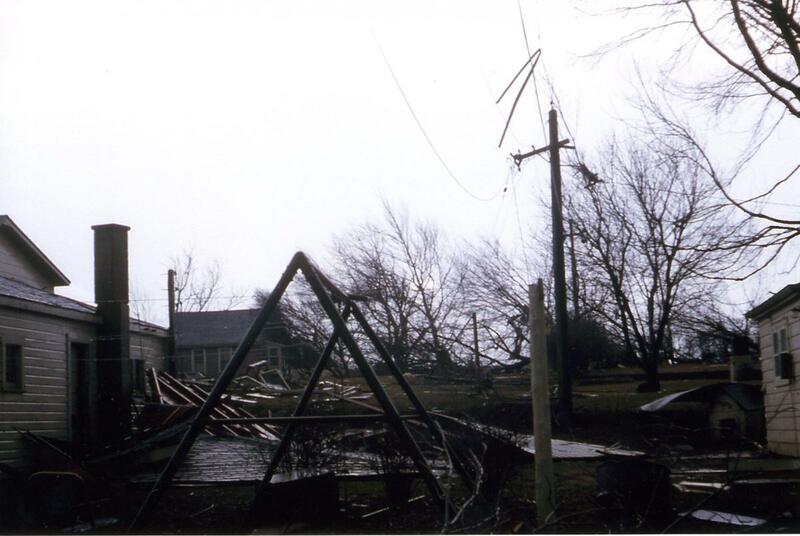 From Orchard Acres, the storm moved northeast over open fields, ripping occasional trees and causing more destruction at Sunrise Farm, just off Route 176. From here it moved on to Island Lake, where it claimed an additional life. Crystal Lake may have been “down” but not “out”. The community of citizens, public officials, emergency personnel, and more rallied to help those in need. Ray Rudden was on the Crystal Lake Police Department in 1965. 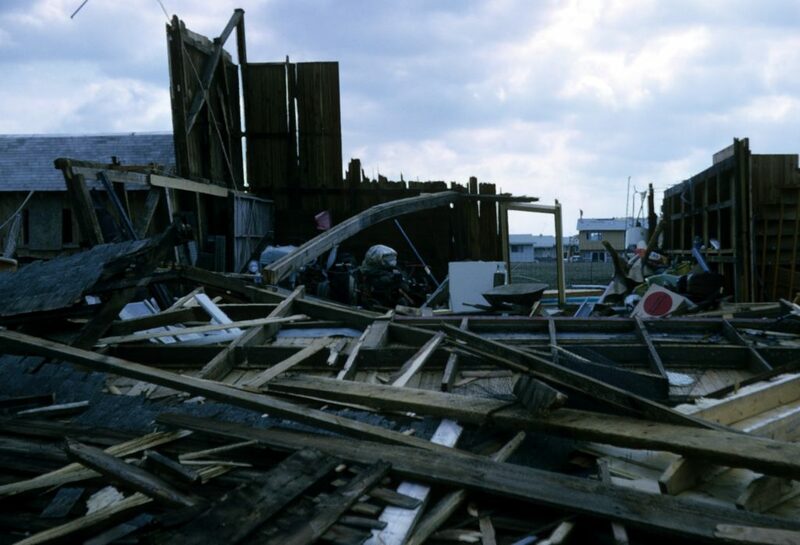 Ray recalls being at home when the emergency siren went off. It should be noted that this siren went off AFTER the tornado hit. The siren was used to summon emergency personnel. 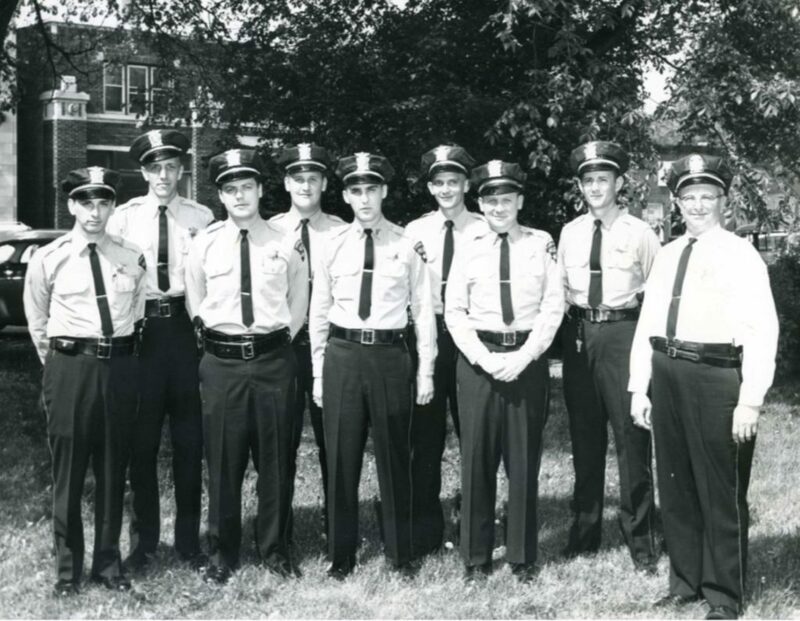 At that time, there were eight guys on the police force; Elmer Oerkfitz was Chief. 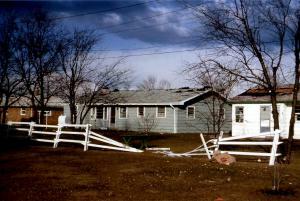 Ray reported for duty and was directed to Colby’s subdivision. For the next week, Crystal Lake’s police force divided themselves up and provided around-the-clock protection of the disaster area. Fortunately, other nearby police departments, as well as state and county officers assisted with patrolling the area to prevent looting. Harold Krecker was the newly-appointed Chief of Crystal Lake’s all-volunteer fire department. In a 2010 interview with Chief Krecker, he recounts that when the fire whistle blew the guys all came out from where they worked. Some went straight to the disaster scene. 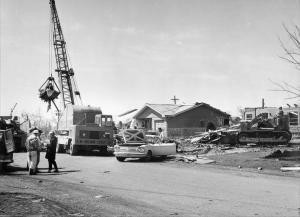 Some went to City Hall (then located at Beardsley & Main) to get the department’s four firetrucks. Main Street was blocked by all sorts of downed poles, power lines, and debris. The fire trucks had to take Woodstock Street to Route 14 to get back to Colby’s subdivision. Scores of emergency vehicles rushed through the decimated Colby subdivision shuttling away the dead and injured. 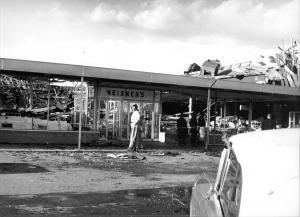 Frantic searches for survivors were immediately started in the rubble of Neisner’s Department Store, one of the hardest hit businesses in the Crystal Lake Plaza. 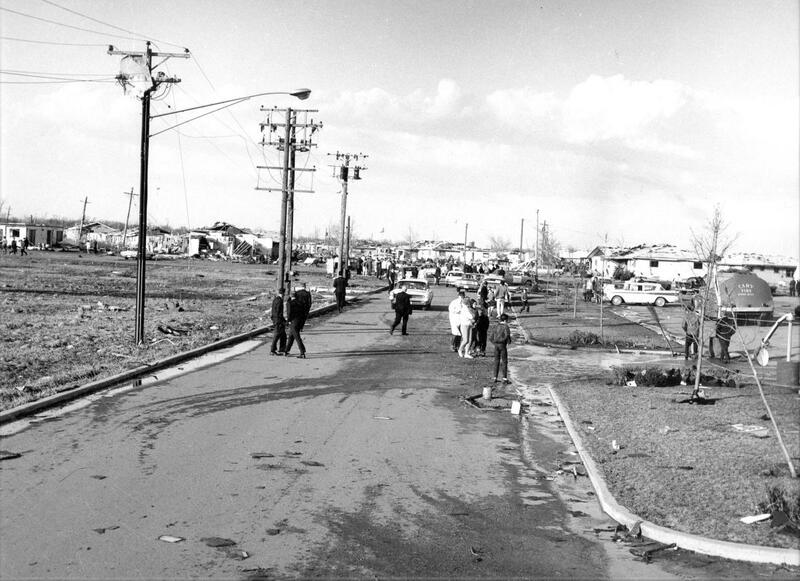 Shortly after the tornado hit and realizing how severe damages were, Mayor Louis Goossens declared a citywide state of emergency and ordered families in the almost totally destroyed Colby subdivision to evacuate by nightfall. The entire disaster area was sealed off to everyone, including homeowners. A temporary hospital facility was first setup at the Czecho Lodge, which was located across the street from the Plaza. It was quickly determined that the restaurant would not be big enough to handle the magnitude of emergencies. 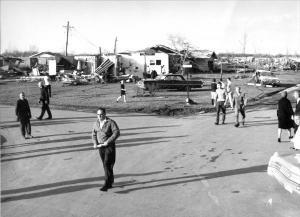 Crystal Lake Community High School’s fieldhouse was then opened up as emergency headquarters. Dozens of registered nurses volunteered their services in shifts through the night at the high school, providing treatment of minor cuts and scratches not needing hospital attention. More serious injuries were treated at three nearby hospitals in Woodstock and Elgin. A changing crew of volunteer women, led by resident Margaret Jenner, prepared and served hot meals and sandwiches at the high school. 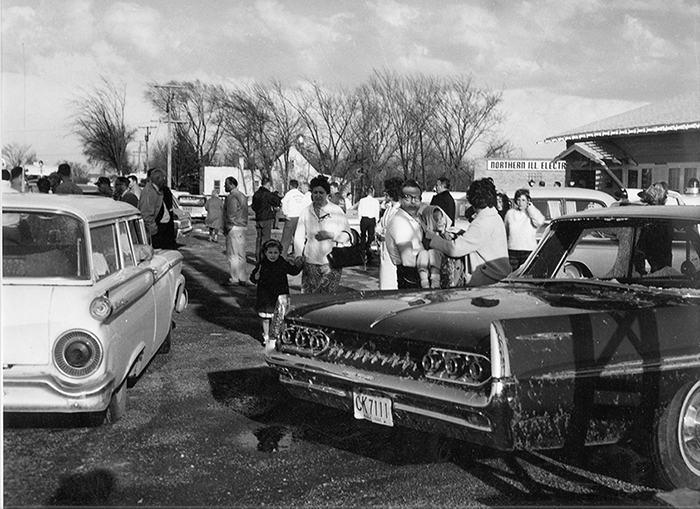 Tremendous quantities of food were cooked for the homeless and cleanup workers. The kitchen later moved its operation to the Masonic Temple on Ellsworth Street where they continued to serve meals. A communications center was set up in the foyer of the gym. 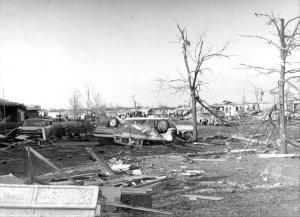 Illinois Bell Telephone established four emergency lines. A short-wave radio center was quickly setup. 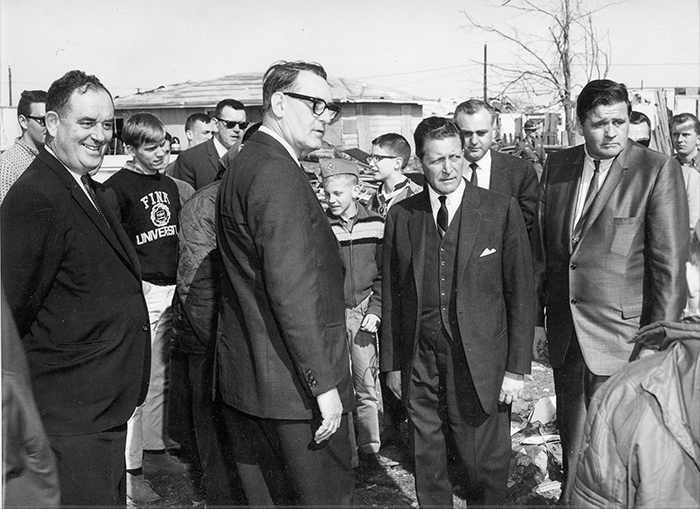 The center was operated by Roy Latham, Jere Dodge, and others. Authorized by City Manager Alfred Roth, the radios were used for close communication for needed supplies and patrol duty at night. Over 200 people came into the emergency headquarters to offer rooms in their homes to the homeless. Because of this outpouring of generosity, NO ONE had to spend the night in the high school gymnasium. When Chuck Aldridge, owner of The Pantry Restaurant learned of the tornado and could finally get through the traffic, he opened his downtown restaurant at 5:30 Palm Sunday evening and stayed open all night to serve the many workers and tornado victims. The Crystal Lake Herald reports that 45 dozen eggs were served at the Pantry restaurant Monday morning the 12th. Food was provided free to known tornado victims. Crystal Lake needed help, and it needed help fast. 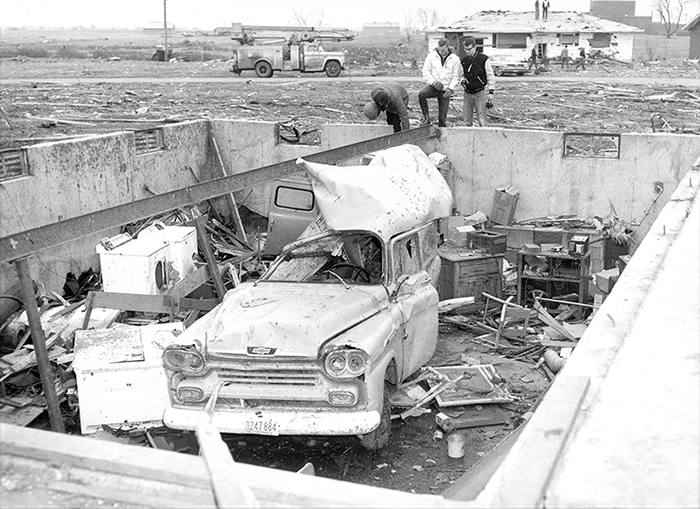 In 1965, Al Querhammer was the Director of Civil Defense. Harry Dillon was appointed Director of Housing. Harry received a call from the president of the Illinois Mobile Home Association. The Association offered to contact its membership and see if they could get donations/loans of used mobile homes to provide temporary housing. Happy to accept the offer, local leaders needed to determine if they should set up a temporary mobile home park OR should they setup the units on the property of the destroyed homes. They took the latter option. 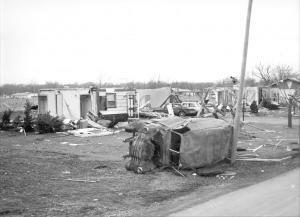 The mobile homes arrived and were setup on the driveways of the destroyed homes. They were hooked up to existing electric, water, and sewer service. Families were able to live in the mobile home on site to oversee the reconstruction of their demolished/damaged home. 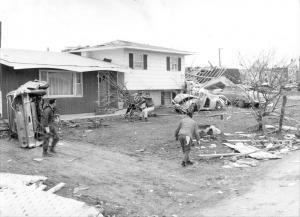 Cleanup efforts began right away. On Monday, several hundred Crystal Lake teenagers registered at the high school for cleanup work. 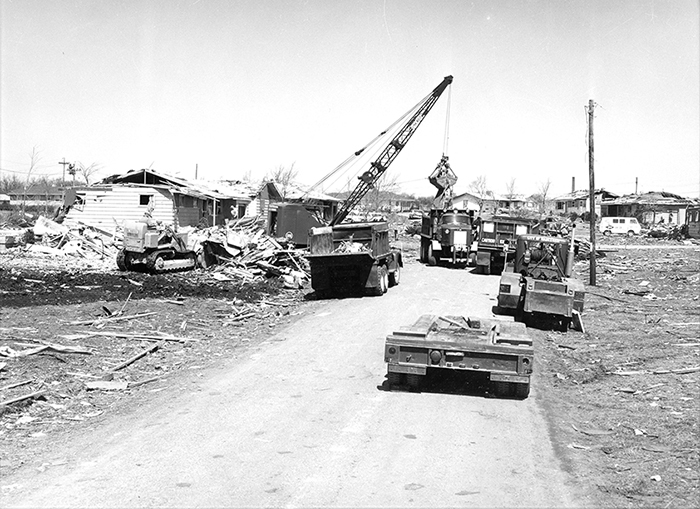 Fifty sailors from Great Lakes came with trucks and cranes. Individual volunteers were listed by the thousands, some working one day, and others many days. They came from throughout the State of Illinois and beyond. Companies donated heavy equipment and operators to help with the cleanup. The compassion of people and companies was overwhelming. A Tornado Relief Fund was set up at Home State Bank and First National Bank of Crystal Lake with an initial donation of $250 coming from the Crystal Lake Lions Club. The fund was administered by a board of trustees including Harold J. Bacon, Mayor Louis Goossens, O’Dean Cross, Bernard Mathews, and William Cowlin. The fund was intended for use by victims who needed emergency assistance. By Wednesday, Alvin Querhammer, McHenry County Civil Defense Director said public aid has been so effective that “we have only two big needs left.” Those needs, he said, were bulldozers and similar heavy equipment, and individuals with rakes, shovels and gloves “who don’t mind getting plenty dirty.” Querhammer said enough gifts of food and clothing had been received. 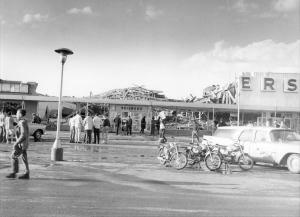 The Cleanup of the Crystal Lake Plaza began right away. 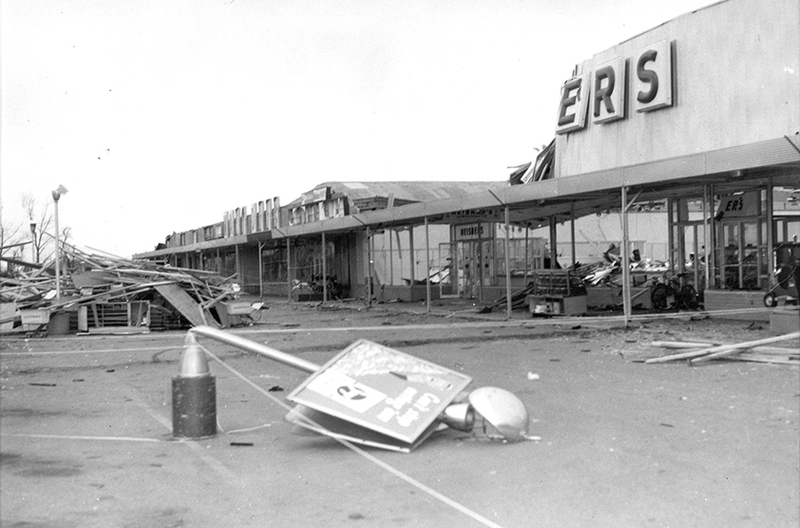 Some of the businesses were able to re-open in a few days or weeks. For others more heavily damaged, such as the Piggly Wiggly and Neisner’s it took months. 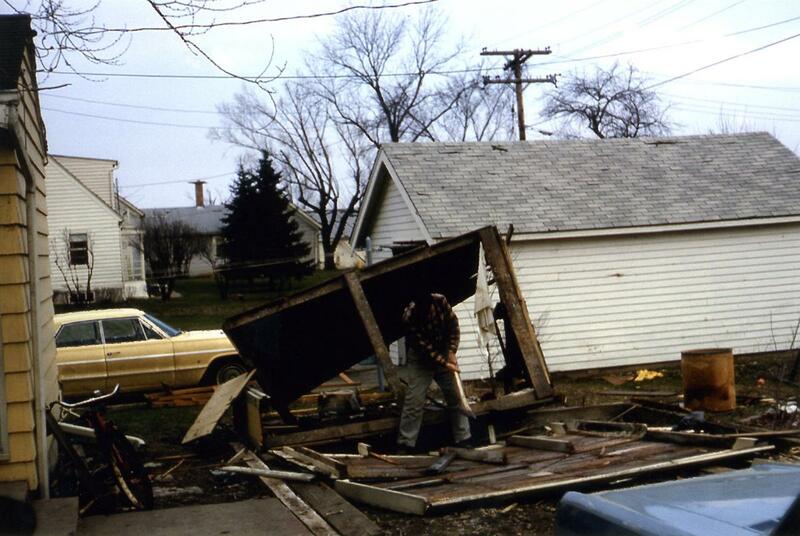 By April 1966 Crystal Lake had a severe weather warning system in place. The City subscribed to the Murray and Trettel of Northfield weather service which could give from 30 minutes to 3 hours advance warning. Should the city be warned of an approaching tornado, the fire sirens will be sounded in a steady burst for a period of five minutes. 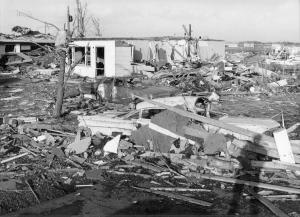 Homes and businesses were rebuilt. 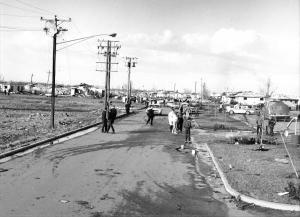 The last of the temporary mobile homes had been removed. People’s lives were back to “normal”. 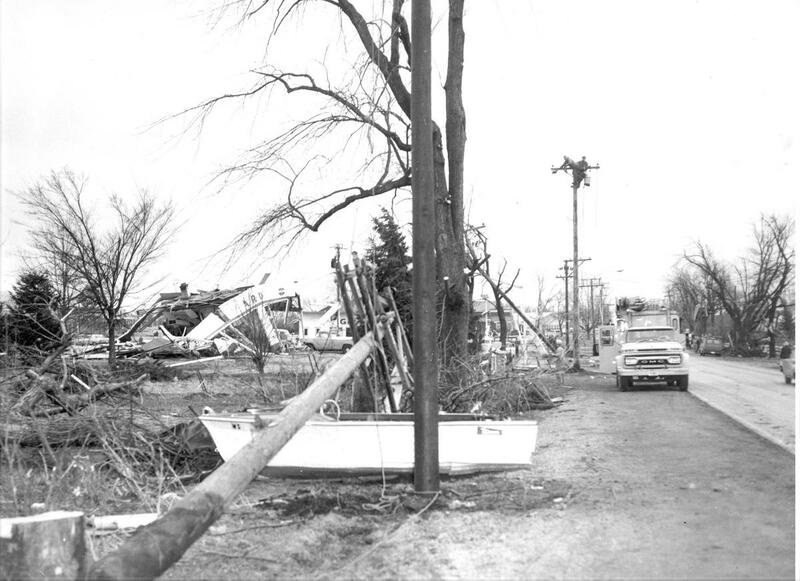 But here we are, fifty years later, and the memories and nightmares of this giant storm are still strong in the minds of those who lived through it. 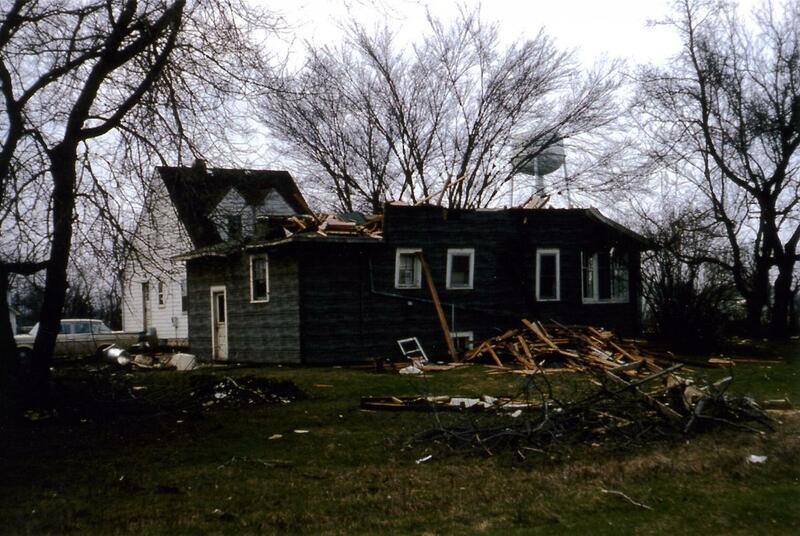 Rae Goss – Age 52, was a member of the Crystal Lake Lions Club and First Congregational Church of Crystal Lake. He was vice president of the Inland Lithographing Co. of Chicago. 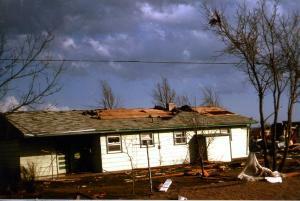 He was survived by his wife Betty, two children, and eight grandchildren. Louis Knaack – He was an official of the Oak Manufacturing Co. and president of the Crystal Lake Park District Board of Directors. 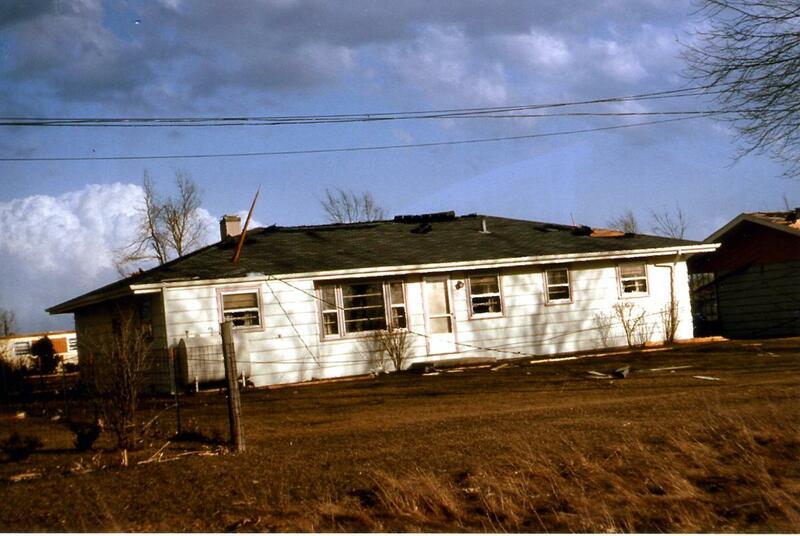 He was survived by his wife Fern, eleven children, and nine grandchildren. Richard Holter – Age 43, was a veteran of World War II. At the time of his death, he was a salesman for Ormsby Motors. Rosalie Holter – Married Richard Holter in 1942. 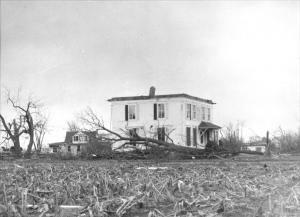 The couple lived on Union Street with their three children. 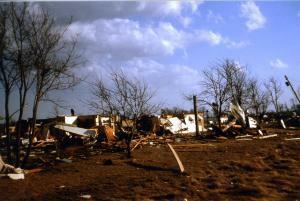 Two of those children, James and Louella, survived the deadly tornado. John Holter – Age 20, was the oldest child of Richard and Rosalie Holter. He was a 1962 graduate of Crystal Lake Community High School and was employed by Graham’s Autobody in Algonquin at the time of his death. The Crystal Lake Historical Society continues to collect photographs, newspaper articles, and personal accounts of the 1965 Palm Sunday tornado. Many of our members lived in Crystal Lake at the time, and have personal accounts of the storm, its destruction, and the community’s response to the disaster. If you have a tornado photograph or personal account that you would like to contribute, please contact us. 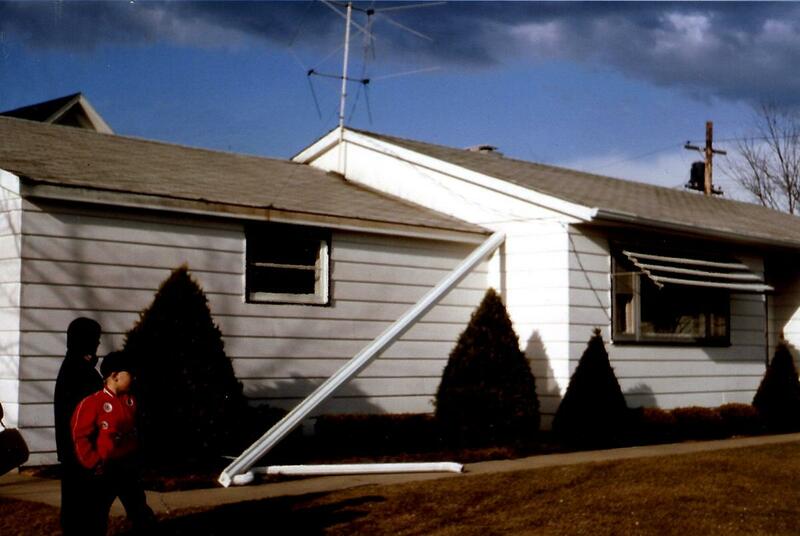 The above home video was taken by Gordon Deutschman who lived on Harold Street in Colby’s Subdivision. The 8mm film was donated to the Crystal Lake Historical Society by Joe Fiore. The above home video was filmed and preserved by Crystal Lake resident, Howard B. Wilbrandt. 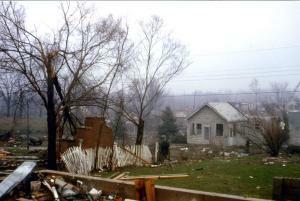 The above home video shows the results of the tornado’s destruction. This video was submitted by a local resident, Thelma Brown. 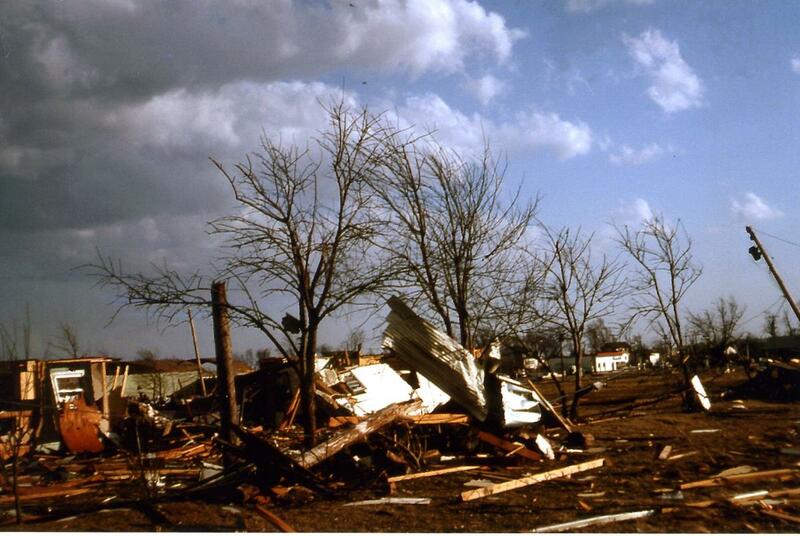 WGN 50th Anniversary Report of the Palm Sunday Tornadoes. Report was aired April 6, 2015. Shared with permission from WGN. © 2019 Crystal Lake Historical Society. All rights reserved.